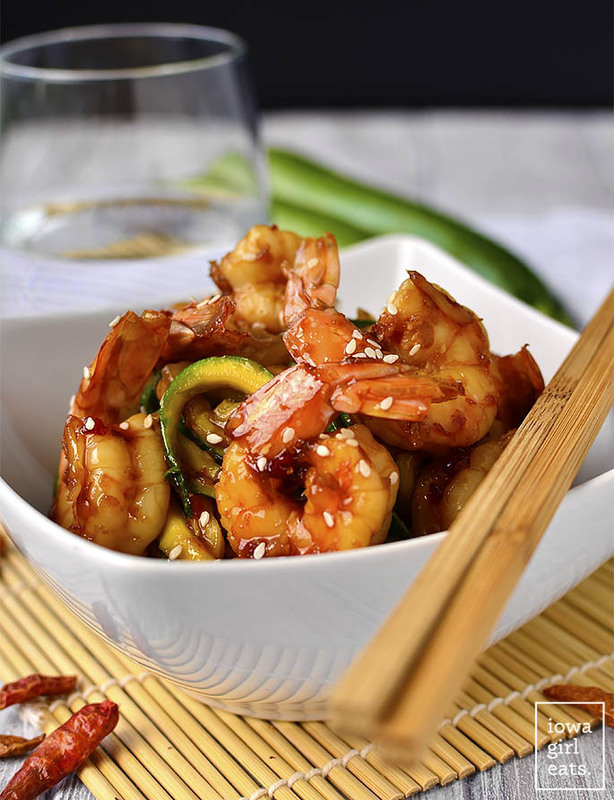 Sweet Chili Sesame Shrimp and Zoodles takes minutes to cook and is full of tongue-tingling flavor. 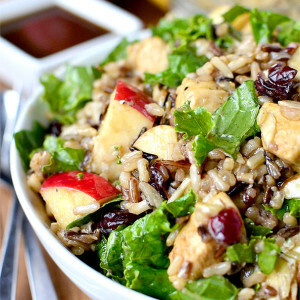 This light and healthy gluten-free recipe calls for just 5 ingredients, too! It’s true what they say that no two children are alike – even if they’re siblings. While Lincoln was content to sit and observe life as an infant, Cam spends his days grasping for anything and everything within reach. Strangers had to work to get a smile from Lincoln, while an ant passing by on the sidewalk is enough to give Cameron the giggles. Lincoln ate what I put on his high chair, and nothing more, while Cameron bangs two tiny fists on his tray when the last puff is gone. If he’s being really dramatic he’ll rip it off, baby Hulk-style, sending bits and crumbs of food sailing throughout the kitchen. Needless to say, the Roomba Ben got me for Mother’s Day is not going unused! Anyway, I get the food fury, I really do. Clearly he got it from his Mama because I totally feel like hurling my bowl across the room in agony when the last bite of Sweet Chili Sesame Shrimp and Zoodles is gone. This easy, summery dish requires just 5 ingredients, 1 skillet, and less than 15 minutes of cooking time. It is SO dang good! 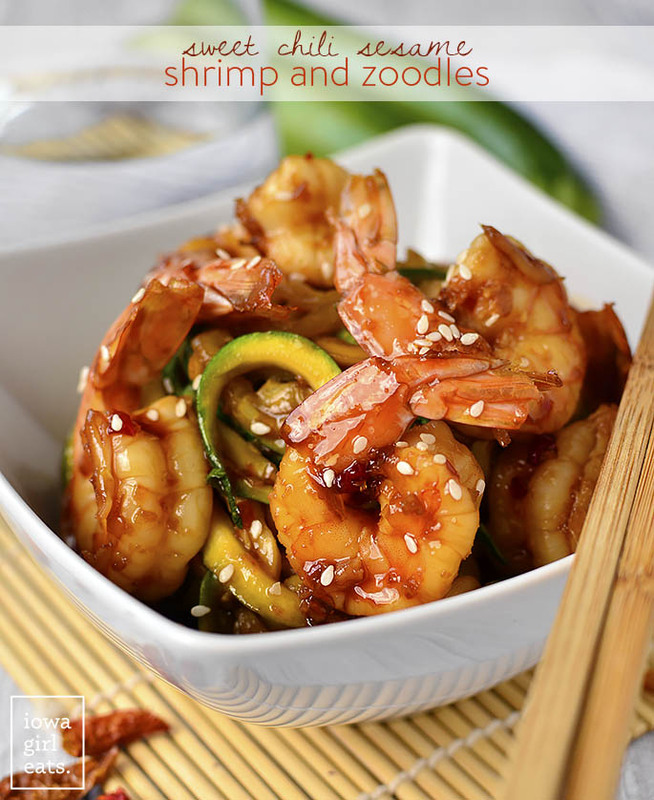 Sweet Chili Sesame Shrimp and Zoodles tastes like a cross between sesame shrimp and a yummy lo mein dish yet is low-fat, low-carb, and gluten-free too! 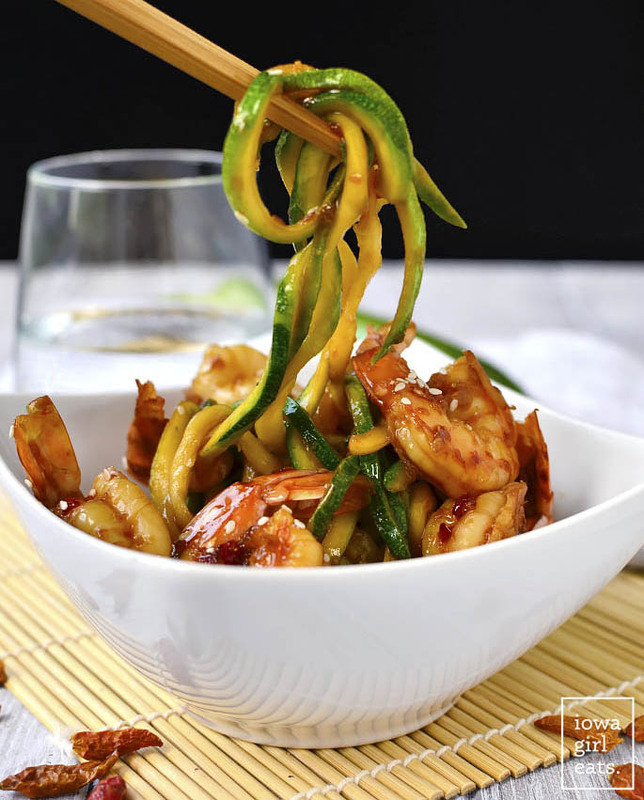 A sweet and savory mixture of sweet chili sauce, gluten-free Tamari, and sesame oil is not only drizzled over sizzling shrimp, but acts as the sauce for a bed of sauteed zoodles. 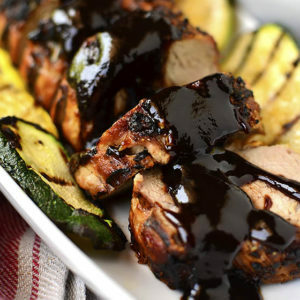 I love when you can get multi uses out of one sauce – couldn’t be easier! After spiralizing the zoodles the night before, plus preparing the sauce ahead of time, I was truly shocked at how fast this recipe came together. Faster than it took to clean up afterwards which is really saying something because it only requires one skillet. 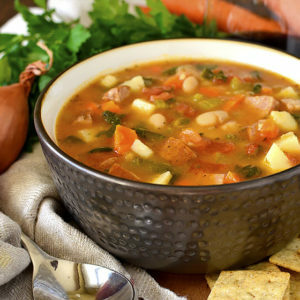 Even if you don’t prep any components ahead of time, this dish is a breeze to whip up. 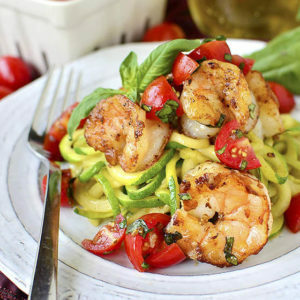 Prepare Sweet Chili Sesame Shrimp and Zoodles on a hot summer night when you don’t want to heat up the kitchen, or truly any time you’re craving a sizzling and satisfying, flavor-packed dish. Who’s hungry? 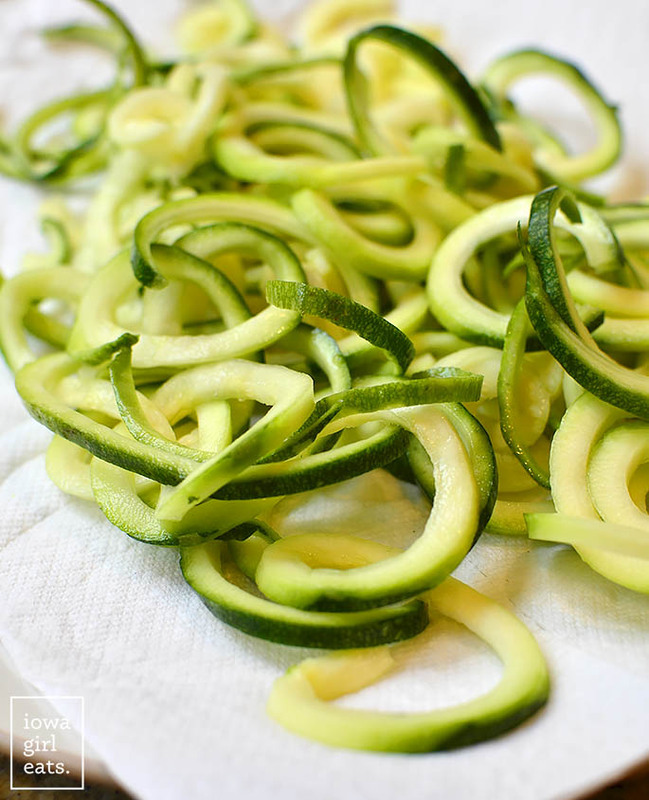 Start by spiralizing 3 medium or 4 small zucchini, that are the same width from top to bottom, with your machine’s largest noodle blade. I love both the Paderno Spiralizer and Inspiralizer. To ensure you don’t get soggy zucchini noodles (gag!) place the zoodles in a colander set atop a bowl then lightly salt and toss with your fingers. Place in the refrigerator for 30 minutes to an hour, to give the salt time to pull some moisture out of the zoodles, then pat dry with a kitchen towel or paper towels. Done! 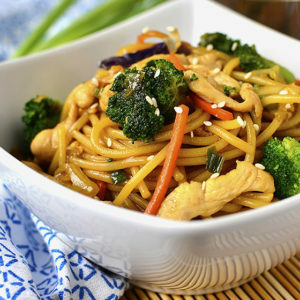 Meanwhile, whisk together 1/4 cup + 3 Tablespoons sweet chili sauce (may seems like an odd amount but a full 1/2 cup is a touch too sweet,) 1/4 cup reduced sodium gluten-free Tamari or soy sauce, and 1-1/2 teaspoons sesame oil in a large bowl. 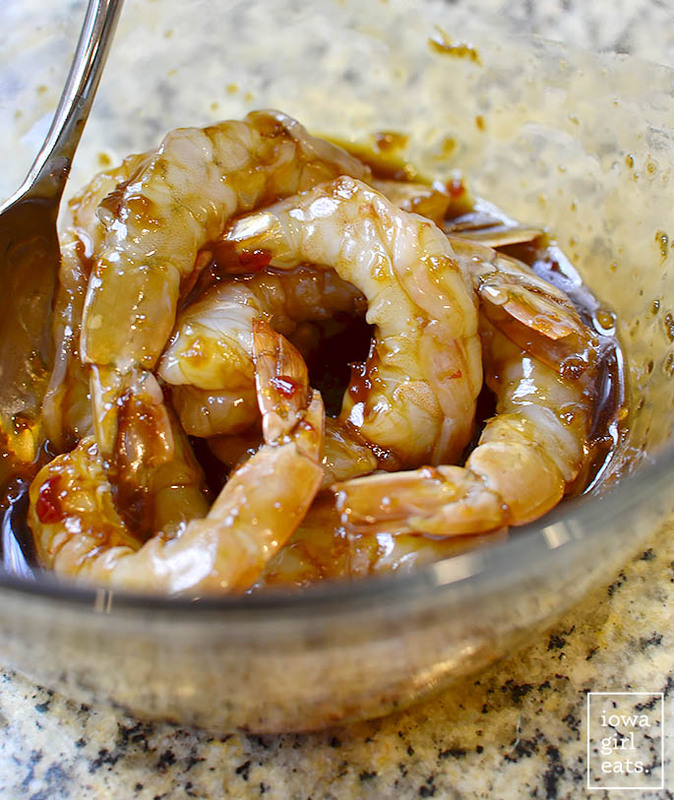 Scoop half the sauce into a small dish and reserve, then add 3/4lb 16/20-count jumbo shrimp that have been peeled, deveined, and patted dry to the bowl with the remaining sauce and toss to coat. 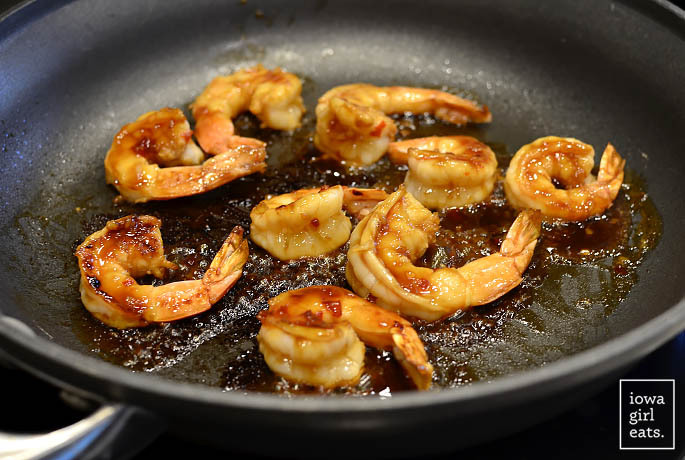 Next heat a large, 12″ skillet over medium heat then spray with nonstick spray or mist with extra virgin olive oil and add half the shrimp. Saute for 2 minutes on one side then flip and spoon a bit of the reserved sauce on top and saute for another 1-2 minutes, or until the shrimp are cooked through. Remove to a plate then repeat with remaining shrimp. Last step is to add the zoodles. Saute for 1 minute then add as much of the remaining sauce as you like and continue to cook until the zoodles are al dente – I like them to be rather crisp in this dish! Finally, add the shrimp back into the skillet to warm through. Minutes later, Sweet Chili Sesame Shrimp and Zoodles! So incredibly easy, I can hardly even stand it! 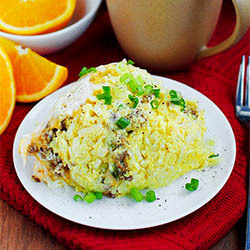 I hope you love this yummy, summery dish – enjoy! 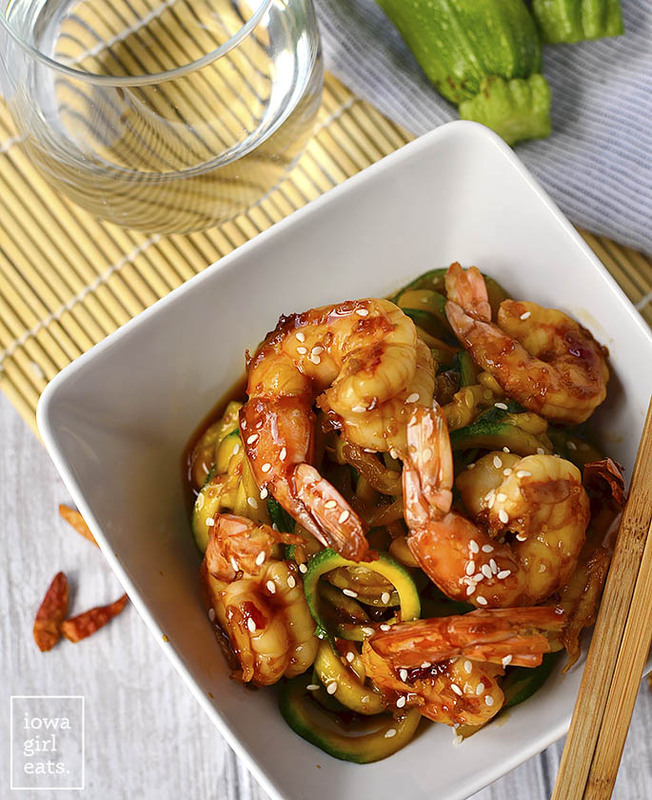 Sweet Chili Sesame Shrimp and Zoodles takes minutes to cook and is full of tongue-tingling flavor. 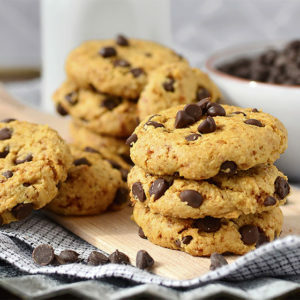 This light and healthy gluten-free recipe calls for just 5 ingredients! Spiralize zucchini using the fattest noodle blade to create zoodles then add to a colander set atop a bowl. Lightly salt then toss with your fingers to coat and place in the refrigerator for 30 minutes to an hour to drain excess liquid. Remove zoodles from refrigerator then pat dry with kitchen or paper towels. Meanwhile, add sweet chili sauce, Tamari or soy sauce, and sesame oil to a large bowl then whisk to combine. Spoon 1/2 the sauce into a small dish and reserve, then add the shrimp to the remaining sauce in the bowl and toss to coat. Heat a large, 12" skillet over medium heat then spray with nonstick spray or mist with extra virgin olive oil. Add half the shrimp then saute for 2 minutes on the first side, and flip. Spoon a bit of the reserved sauce on top of the now cooked side then continue to saute for another 1-2 minutes, or until cooked through. Remove to a plate. Respray or mist skillet then add remaining shrimp and cook, repeating spooning sauce over the second side, and remove to the plate. Turn heat up to medium-high then add zoodles and saute for one minute. Spoon desired amount of remaining reserved sauce into the skillet, depending on how saucy you want the zoodles, then toss to coat and continue to saute until zoodles are crisp-tender, 1-2 additional minutes (I like them more crisp for this dish.) Add shrimp back into the skillet to warm through then scoop into bowls and serve. I recommend the Paderno Spiralizer or the Inspiralizer. 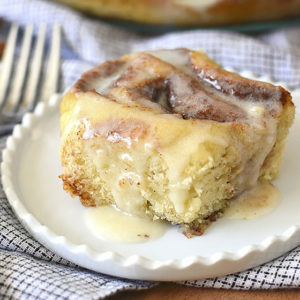 Um, yum! Love sweet chili sauce and bet it would (clearly) be awesome on shrimp + veggies. Definitely trying! I hope you love it, Traci! I just got a spiralizer and I’m obsessed with it, I keep thinking why did I wait so long to get one of these! The obsession is real! Soon you’ll be planning weeks around your spiralizer! 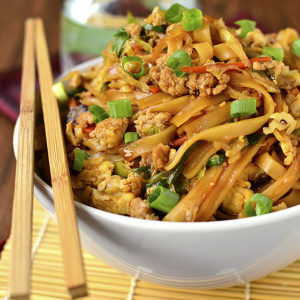 Love the sound of this dish! Shrimp is one of my favourite foods and I bet the sweet chili makes a great combination! 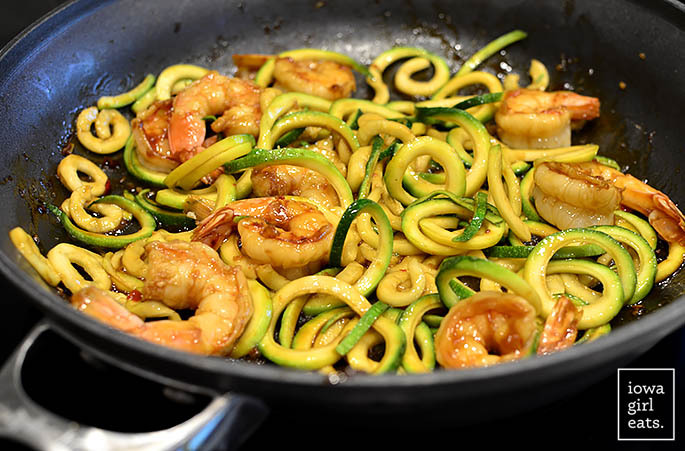 The shrimp holds up really well but the zoodles are best eaten right after cooking. The Roomba is a GAME CHANGER, especially with little ones. It honestly improved the quality of my life, lol. I hated sweeping multiple times a day. I love it that I can program it to get to work at the same time every day and come home to a clean kitchen and living area! Same! So nice to come home to carpet lines without having to lift a finger! ? I love love love sweet chili sauce! 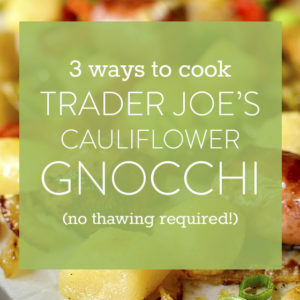 I absolutely cannot wait to try this dish! And as someone who absolutely hates doing the dishes after supper I really appreciate that this only requires one pan. 1 skillet dinners are life! 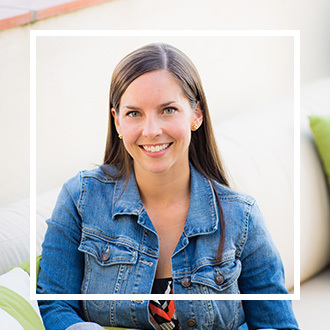 Aside from the very important fact that you have inspired and helped my daughter with your gluten-free advice and e-book (both of her kids were diagnosed with celiac this year), I just want you to know what a pleasure it is to have been reading your blog for years and years! 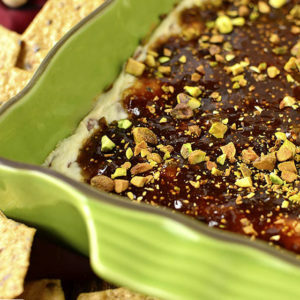 I began following you because a friend brought one of your layered dips to a party and I’ve been hooked ever since. 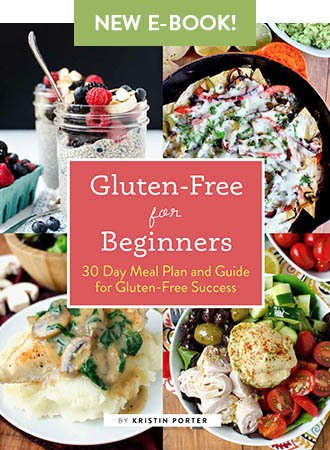 I love seeing glimpses of your family…your precious boys, family trips, etc., and I totally am cheering you on in your successful attempt to have a gluten free life. Sending love from Massachusetts! I made this dish last night and my husband said it was one of his favorites! I loved it too. Awesome!! So glad you both enjoyed it. :) Thanks for leaving your feedback! I made this last night and it was AWESOME!! Even my somewhat picky husband and daughter liked it. Thanks! Oh I’m so glad to hear it, Laurie! Thanks for leaving feedback! I made this tonight and it was excellent! The only problem I had was there wasn’t enough! I added some green onions and water chestnuts. 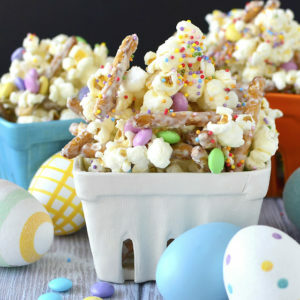 My kids loved it and my husband loved it. It’s rare to try something new and the whole family is on board. 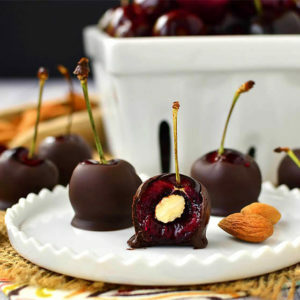 Thanks so much for the awesome and simple recipe. Wow, a hit with the whole family – I LOVE it! Thanks for your feedback, Susi! 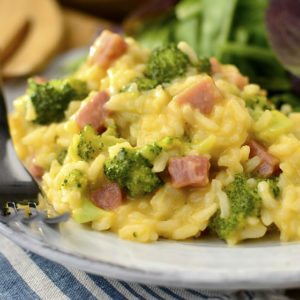 What is the calorie count per serving for this dish? I just bought a Cuisinart Spiralizer and saw this recipe. It was an absolute hit for me and my DH. I doubled the shrimp (great cold for a healthy protein lunch). A definite addition to our rotation! For WW members, with shrimp doubled and servings changed to 4 it is 7 Smart Points. So, you do the zoodles the night before and they keep ok??? Hi Tammy! No, I spiralize the noodles 30 minutes to an hour prior to making the dish, so I can salt them then press out any excess moisture that comes out.